Diagram of one version of the derivation of the Arabic word muslim in autosegmental phonology, with root consonants associating (shown by dotted grey lines). Nonconcatenative morphology, also called discontinuous morphology and introflection, is a form of word formation in which the root is modified and which does not involve stringing morphemes together sequentially. freeze /ˈfriːz/ → froze /ˈfroʊz/, frozen /ˈfroʊzən/. /mar-/ "die" ↔ /maːr-/ "kill"
Chalcatongo Mixtec /káʔba/ "filth" ↔ /káʔbá/ "dirty"
English record /ˈrɛkərd/ (noun) ↔ /rɨˈkɔrd/ "to make a record"
Another form of nonconcatenative morphology is known as transfixation, in which vowel and consonant morphemes are interdigitated. For example, depending on the vowels, the Arabic consonantal root k-t-b can have different but semantically related meanings. Thus, [kataba] 'he wrote' and [kitaːb] 'book' both come from the root k-t-b. Words from k-t-b are formed by filling in the vowels, e.g. kitāb "book", kutub "books", kātib "writer", kuttāb "writers", kataba "he wrote", yaktubu "he writes", etc. 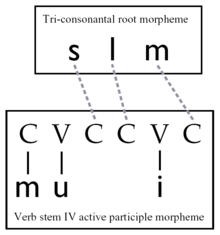 In the analysis provided by McCarthy's account of nonconcatenative morphology, the consonantal root is assigned to one tier, and the vowel pattern to another. /k̠ɨhɨl/ "red" ↔ /k̠ɨp-k̠ɨhɨl/ "flaming red". A final type of nonconcatenative morphology is variously referred to as truncation, deletion, or subtraction; the morpheme is sometimes called a disfix. This process removes phonological material from the root. Nonconcatenative morphology is extremely well developed in the Semitic languages in which it forms the basis of virtually all higher-level word formation (as with the example given in the diagram). That is especially pronounced in Arabic, which also uses it to form approximately 90% of all plurals in what is often called the broken plural. ^ Haspelmath, Martin (2002). Understanding Morphology. New York: Oxford University Press. ISBN 0-340-76026-5. ^ McCarthy, John J. (1981). "A Prosodic Theory of Nonconcatenative Morphology". Linguistic Inquiry. 12: 373–418.